There might have been a common theme. Flowers of course- but no, not just flowers. 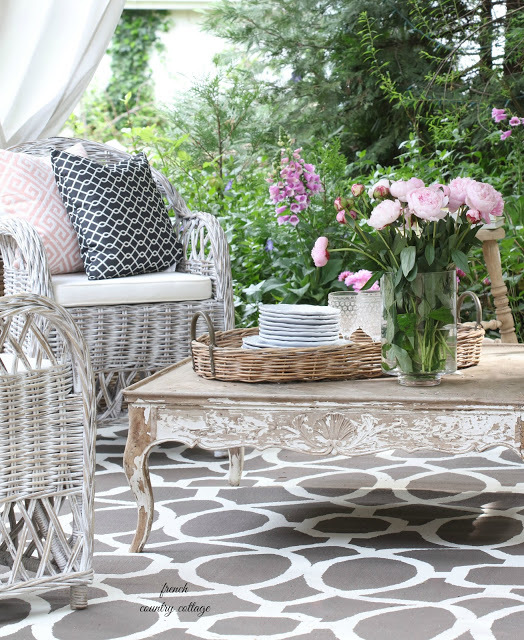 Flowers, tables, and romantic inspired outdoor living. were the ones that were outdoors and under the stars. 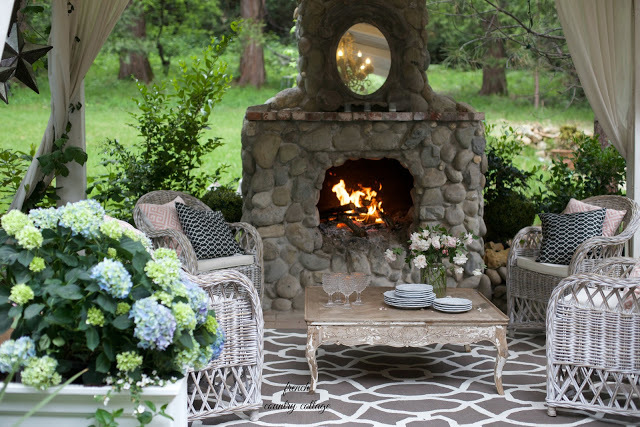 Outdoor living is a big part of our lifestyle here in California and I admit that entertaining outdoors is one of my favorite things. So today, I am sharing a couple of my favorite outdoor entertaining posts from 2016. The patio is a spot we enjoy using almost year round. It is a covered space and with a fire in the rock fireplace- we can push the seasons just a bit longer when it is chilly. the pea gravel patio where the outdoor dining table is set up. 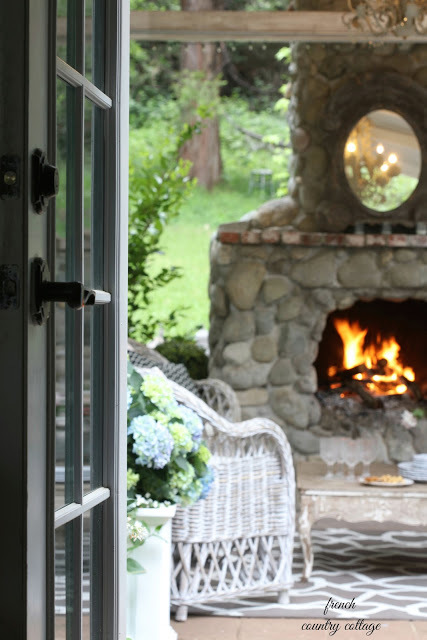 and the fresh air and ambiance all around. 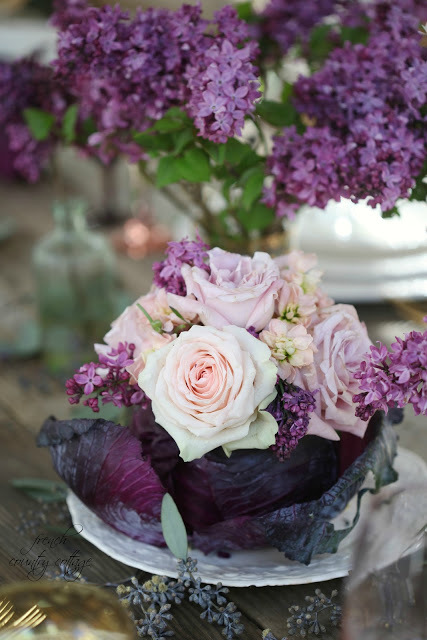 - a trio of purple cabbages made into centerpieces. I was inspired by the gorgeous purple lilacs- and pale blooms together and just so happened to have a few small cabbages on the counter - and thought why not. along with several new renovation projects on the list. And today I am so excited to be joining my Farmhouse Blogger friends in sharing their favorite post from 2016 and what they have up their sleeves for the new year. Your posts remind me of those old Calgon commercials--they take me away. A treat every time. Thanks for the links--several are new to me. Love it! And thanks so much for stopping by and for your kind comments and friendship this year- happy New Year!! Oh my goodness, Calgon commercials, those take me back:). You have a beautiful background for photos outdoor and your patios. Perfect for celebrations of life:). Of course you have perfect models too, your little pups! Thanks so much Kathleen- happy New Year!! 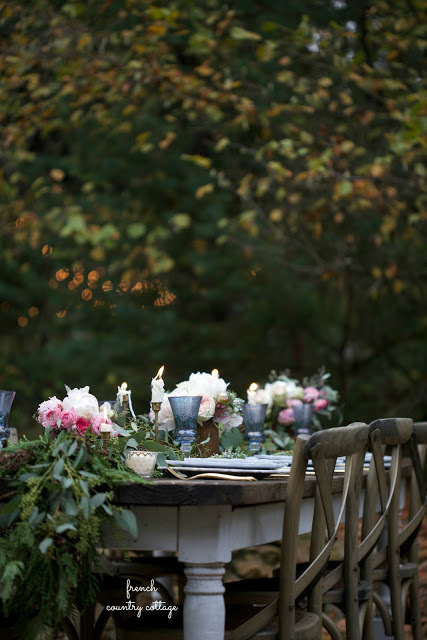 Oh, those outdoor entertaining photos make me long for summer here in frigid Michigan. We are having below freezing temps right now and I don't want to step a toe outside! I might have to schedule a flight and come see you to get a bit of sunshine and warmth. Oh, and yes, and some outdoor partying! Would be fun! Thanks for stopping by Naomi- and stay warm! Thank you for sharing. The spaces are absolutely beautiful. Thank you for stopping by Candy! Thank you DeAnna! You will love the Burano flutes- they are gorgeous!! OMG!!! what an incredible space!!! The fireplace is so cozy!!! 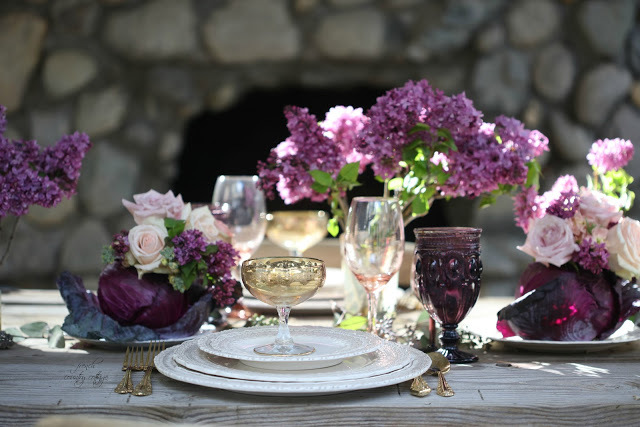 My favorite picture is the table setting with the purple lilacs!!! I swooooooon for lilacs & your display was stunning!!! Pinned it to one of my boards!!! I loooove reading all of your posts and looking at your gorgeous pictures! You give me such inspiration for decorating my own home. I have a question - in the first picture, how did you get that look on the table? The coffee table. I have some french dining chairs that are a dark stain and I want them to have a softer, more romantic look, like the rest of my house. So I need some good advice on how to do it. I've never used the wax that's so popular these days. But I'm wondering if that would be a good option for me since I don't want them completely white. Any advice or help? I sure appreciate it!